Amazingly powerful output and killer sound quality for its small size. 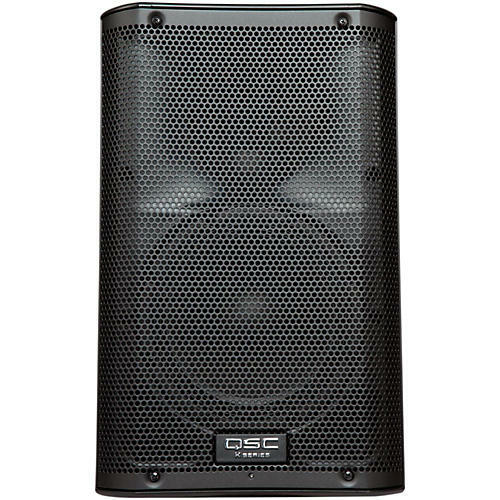 The QSC K10 punches above its weight class with unrivaled sound quality and solid workmanship that stands up to the rigors of professional use. Even more impressive is you get all this in a remarkably compact, lightweight and stylish enclosure for effortless handling and set up. Under the hood you'll find an efficient Class D power module that pumps out 1000 watts of clean, distortion-free sound with crisp highs and deep, rich lows. With 90 degrees of coverage, the K10's woofer drives low frequencies down to 56Hz making it ideal for a wide range of applications including DJing or live reinforcement of instruments, especially in smaller venues. Paired with a K Series subwoofer there's not much this speaker can't handle. Equally comfortable as a stage monitor, the K10 enclosure has an angled side for use as a low-profile, horizontal wedge and a flat side for proper side-fill use. QSC incorporates several proprietary DSP technologies into the K10, including Digital Extension and Excursion Processing (DEEP). DEEP allows K10 to deliver levels of low-frequency extension previously impossible in enclosures of this size. Another innovation is Intrinsic Correction, which uses dozens of spatially-averaged measurements mapped to the processor to deliver smooth and accurate reproduction across the entire sound field. Preventing amplifier clipping or overload is QSC's proprietary GuardRail technology, which monitors the input voltage and controls the amplifier output stage before the onset of clipping. The back of the K10 features two XLR-combi inputs, each with its own level control. Both accommodate line-level inputs and one may be switched to microphone level sensitivity. Phono (RCA) input jacks are also included for connection of consumer electronics sources. Dual XLR outputs are provided for dual "loop-thru" XLR/M connectors and a single XLR jack is available as a summed output. All three input sources may be used at once and mixed via the two gain control knobs. In addition, user EQ controls are provided to select between different subwoofer settings. For installed applications, connecting a commonly available potentiometer to the unit's Euroblock connector allows the operator to have gain control from a remote location. Multiple K Series units can be daisy-chained together to one centralized control. The K10 may be pole-mounted, suspended, or yoke-mounted. The K10 yoke accessory kit (not included) allows for either horizontal or vertical yoke mounting, providing a flexible means of attaching K Series loudspeakers to a building structure or truss. When suspended deployment is required, M10 threaded inserts support vertical or horizontal suspension, while the integral polemount socket accommodates 35 mm speaker poles for use on a speaker stand or over a sub. The pole socket is designed so that the speaker may be angled down 7.5 degrees in order to cover the audience while keeping acoustic energy off reflective walls and ceilings. For unrivaled quality and power in a small package, order a pair of K10s today.